The best way to find out how accompanies doing is to ask their customers. Obviously, it’s not practical for you to call up every one of those customers. Instead, there are plenty of outlets online that you can read reviews about any business. 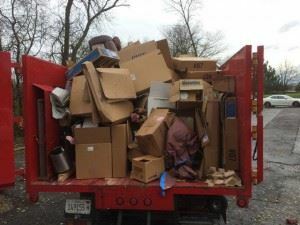 It’s clear from reading these customer posts for Junk King Richmond that this is one junk hauling service that is getting the job done right. It doesn’t matter to junk King whether you’ve got something in the backyard, down the basement, up in the attic or out of the garage. All they care about is making sure everything you want removed is gone in a single session. If it takes two movers to bring something into your home, then it will take two movers to take it out again. That is exactly what Junk King Richmond is going to provide to you. These are workers who have a lot of experience lifting and loading all kinds of heavy objects. Don’t hesitate to ask them to remove anything regardless of size or weight. Junk King Richmond prides itself on its rapid response. You won’t have to wait long to get rid of your junk when Junk King Richmond is just a phone call away. This entry was posted in Richmond Junk Removal and tagged Junk King, junk removal, reviews on September 26, 2017 by Junk King. Last updated September 26, 2017 .